The United States Congress designated the Goshute Canyon Wilderness (map) in 2006 and it now has a total of 42,544 acres. All of this wilderness is located in Nevada and is managed by the Bureau of Land Management. The 11-mile long Goshute Canyon Wilderness is a rugged, uplifted range, with massive white limestone cliffs jutting from its slopes. The lower elevations are thickly forested by pinyon pine and juniper, while scattered bristlecone and limber pine occur at the higher elevations. Aspens and cottonwoods in moist drainages provide a cool retreat. The large, high elevation Goshute Basin, rimmed by peaks, contains expanses of aspen and white fir and are filled with wild flowers in the spring and summer. Elevations within the Wilderness boundaries range from 6,000 to 10,410 feet. Snowmelt and numerous springs provide riparian settings and water sources for a great number of wildlife species including Bonneville cutthroat trout in Goshute Creek, mule deer, mountain lions, bobcats, and various birds of prey. 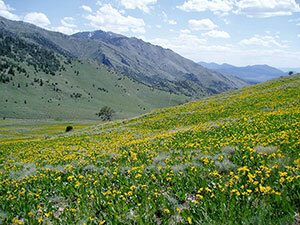 Planning to Visit the Goshute Canyon Wilderness? How to follow the seven standard Leave No Trace principles differs in different parts of the country (desert vs. Rocky Mountains). Click on any of the principles listed below to learn more about how they apply in the Goshute Canyon Wilderness.